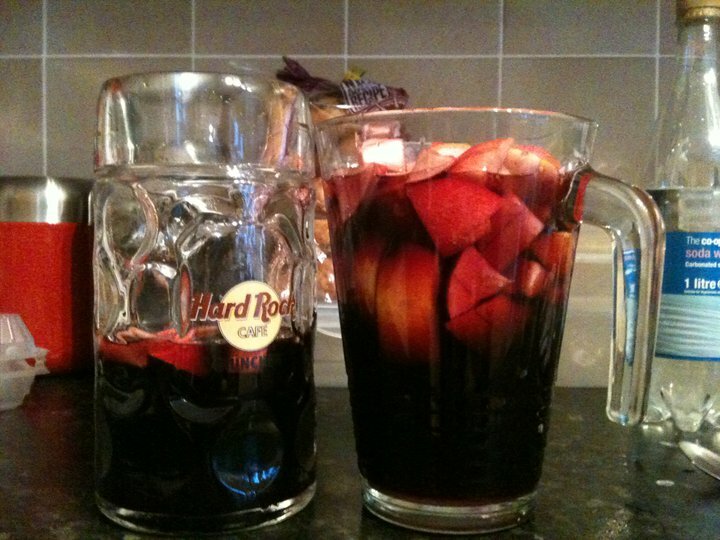 Sangria is a spanish drink and really is a bit like an Italian pizza, in the sense that you can add your own bits and pieces depending on your personal preferences. Pour the wine into a jug or punch bowl and add the lemonade. Chop the oranage and lemon in half (one half should be chopped into pieces and added to mix, the other half should be squeezed and the juice added to the mix). Chop the apple into pieces and add to the mix. Add sugar if you prefer it sweeter. Serve in a tall class with plenty of ice. If the drink isnt strong enough add a couple of shots of vodka or cointreau or bacardi to the mix. 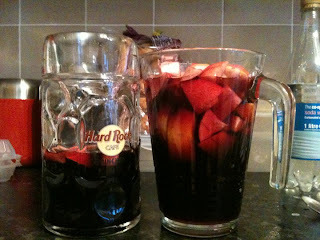 planning a long day of cocktails in jugs on Friday... might well try this one!